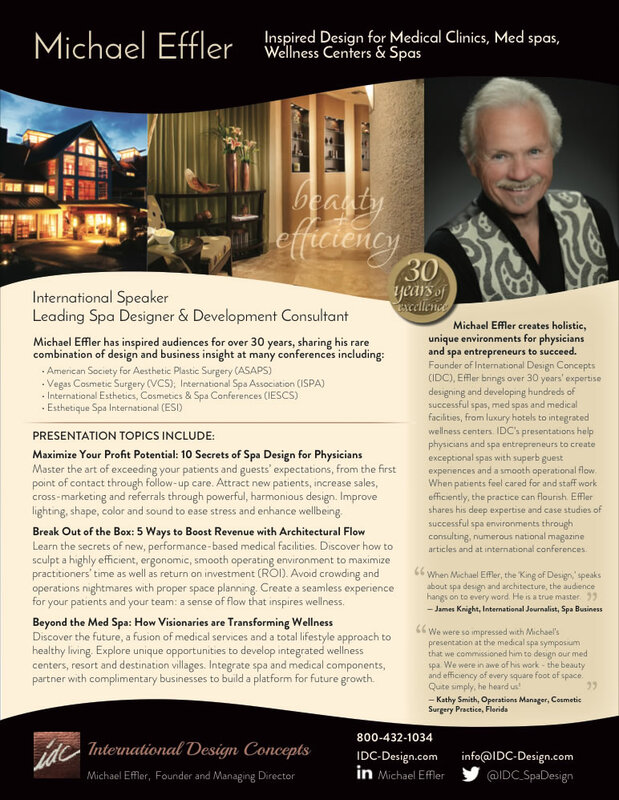 IDC's Michael Effler is committed to raising consciousness in the spa industry, giving back by sharing spa design expertise at spa industry and medical events and seminars. "Maximize Your Profit Potential: 10 Secrets of Spa Design for Physicians"
"Break Out of the Box: 5 Ways to Boost Revenue with Architectural Flow"
"Beyond the Med Spa: How Visionaries are Transforming Wellness"
"Design for Wellness: How to Increase Revenue from Your Existing Practice"
"From Green to Gold: How to Build Sustainability into Your Spa"
International Wellness Conference, Galveston, Texas. Deepak Chopra, M.D., Larry Dossey, M.D., Stedman Graham, Christiane Northrup, M.D. & Don Miguel Ruiz, M.D. Sea Courses, Princess Cruises, Alaska. "New Frontiers in Medical Profitability"
International Spa Association (ISPA), Anaheim, CA. IDC shared platform with UT Design Group. Spacifically, Atlanta, Los Angeles & Anaheim. IDC shared a platform with Clodagh. Check back for upcoming seminars and presentations.